Way back in those sunny days of June me and my feathers were involved in a ‘festival special’ designer showcase at That Thing, where all my favourite local festival wear designers gathered for a very jazzy in-store party. The smorgasbord of colours and textures on show at the party was a testament how festival fashion has exploded in recent years… all things fluffy, sparkly, skin tight and bright are definitely no longer reserved for wearing in fields in the summer months! 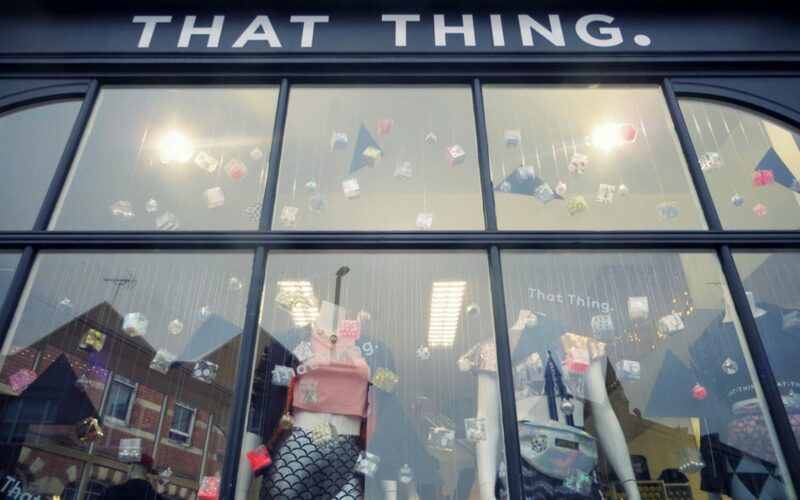 That Thing, formerly Shop Dutty, is a Bristol street-wear brand who’s beautiful premises in Stokes Croft also stocks a huge range of other independent designers. I’ve been going to in-store parties there for a few years now and as ever they went all out on making it an immersive experience. 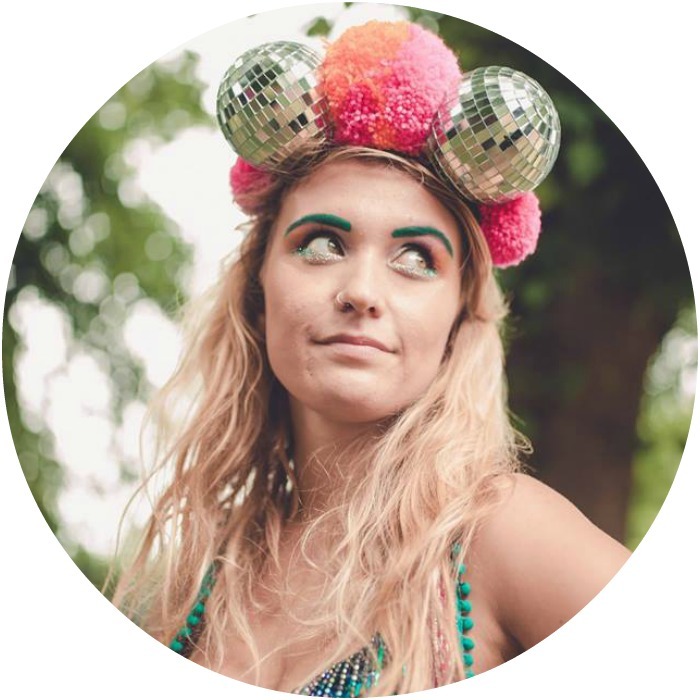 Free drinks, DJ’s spinning tunes, gorgeous window dressing and decor from Miss 4ire complementing the wares within as well as free glitter from The Fashpack. I also got to meet another Bristol blogger, Emma of No Debutante, for the first time! 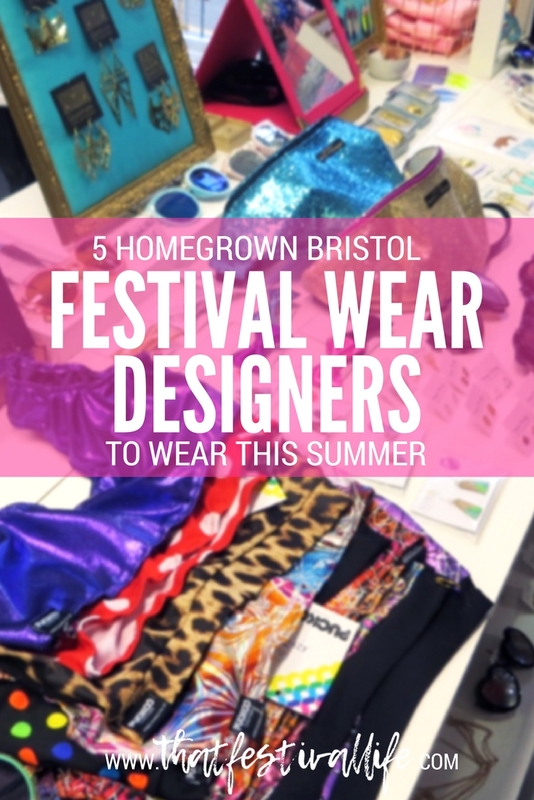 It was a wonderful explosion of pattern and embellishment with many pieces I wanted to get my hands on… Here are some of my highlights, all Bristol based small brands you should be looking out for this summer… and I’m proud to say all my mates! Also the director of That Thing, this is one of the multi-faceted Joh’s more sparkly side projects. She makes very distinctive patterned bumbags and other wonderful furry spangly things! I love the print on this pink & gold bum bag. I met Zoe three years ago when we had neighbouring stalls at Shambala. Her wares match her personality – flipping mental! She makes all sorts from gorgeous feather headdresses (as seen on Eva Lazarus) to my favourite pom-pom earrings of which I have had many pairs. Shared a stall with this talented duo at Love Saves the Day this year and it was a match made in heaven! Ruth and Gemma make wonderfully inventive and striking pieces predominantly from lycra in their cute studio… I’ve been keeping an eye on what they’ve been cooking up this year and it looks exciting! I met Luci when we had neighbouring stalls at Love Saves the Day 2 years ago. She is killing it on the pole fitness & yoga scene at the moment with her amazing 2 piece sets for bendy girls. My favourites are the shattered glass print. 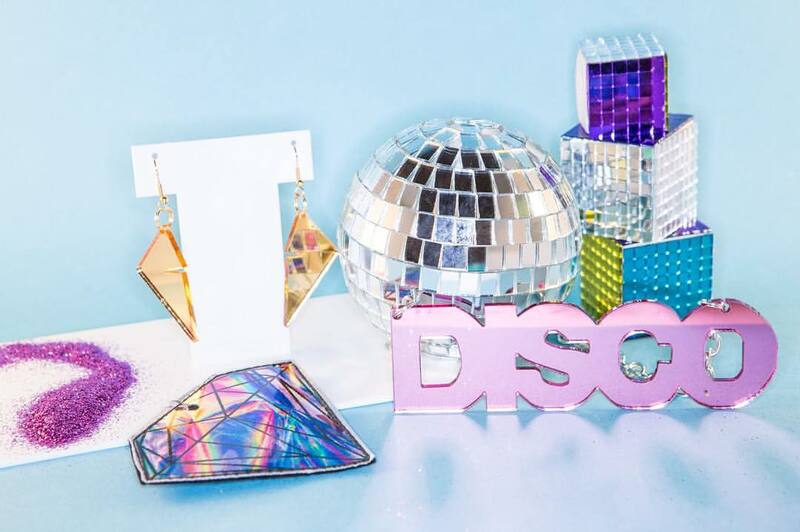 My clever chum Jessica makes wonderful body adornments out of laser cut perspex and futuristic prints. Does a necklace that just says ‘YES’ in giant mirrored gold letters sound flipping fantastic to you? Me too. 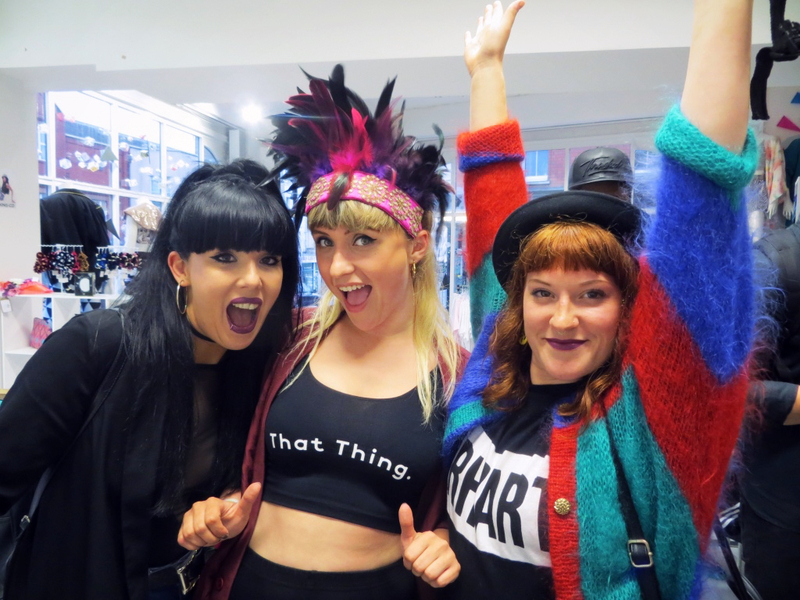 Me with the Neat Frontage gals in a Dulcie’s Feathers headpiece & That Thing crop. 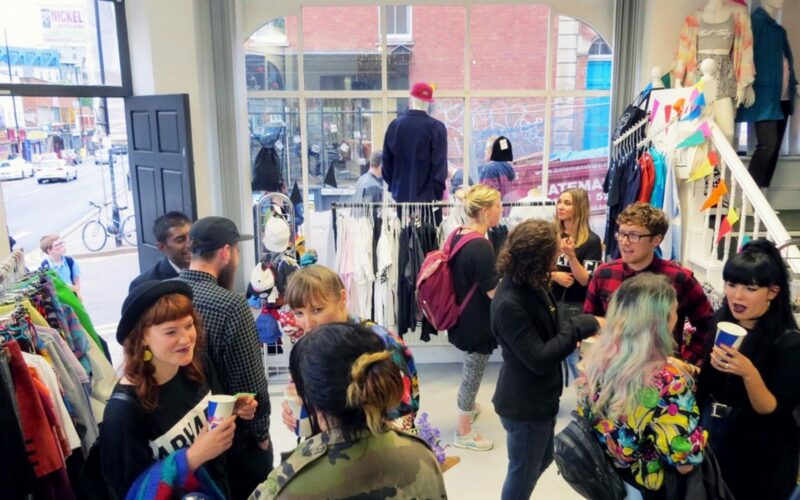 You can find all of these designers in store at That Thing in Stokes Croft or on their respective websites.